On a hot and humid day in early August, at the International Marine Terminal (IMT) on Commercial Street in Portland, wearing a hard hat and yellow vest, Shaelan Donovan ’18 posed for a photo against a blue shipping container. Surrounded by massive machines lifting the metal boxes, stacking them into neat rows, the senior Economics student at the University of Southern Maine (USM) looked out over the container yard. “It’s good to be back,” said Donovan, who hails from Kennebunk and interned at the IMT in the spring of 2017. She recently returned from Iceland, where through a unique partnership between USM and Reykjavík University (RU), she was able to take business classes while advancing her career in international trade — the first USM student to do so. “It’s interesting because (Reykjavík) is definitely bigger than Portland, but it’s similar,” she said of the Nordic country’s capital. The two universities signed documents to develop a comprehensive academic partnership in 2016. In 2017, USM President Glenn Cummings and Ari Kristinn Jónsson, president of RU, expanded their relationship to provide more opportunities for student and faculty exchanges with a particular focus on internships. While Donovan is the first USM student selected to take advantage of the formal exchange program with RU, she’s certainly not the first to explore what Iceland has to offer. In the summer months of 2017, several groups traveled to Iceland from USM — including students from the Tourism and Hospitality Program, the Honors Program, Maine Regulatory Training and Ethics Center, the USM School of Business and the Muskie School of Public Service — all taking in the incredible landscapes and learning about the Icelandic way of life. But Donovan’s exchange was trailblazing. Donovan started her voyage in international trade at the IMT, where she worked as an intern during the spring semester of 2017 performing research projects and building business systems for the terminal’s clients. She said the experience was transformational in her understanding of global economics. “My economics degree is really important for me,” she said. While internships at the IMT are no doubt beneficial for students as they gain real-world experience, they also have tremendous rewards for those charged with managing Maine’s imports and exports. David Arnold, chief executive officer of Soli DG, the company that manages the IMT on behalf of the Maine Port Authority, said Donovan was well-prepared for her work on the terminal. He credited her education at USM for giving her the skills necessary to keep up with the workload. Trade supports 180,500 — or 1 in 4 — Maine jobs, according to the Maine International Trade Center (MITC), of which USM is a part. Since 2009, Maine jobs related to trade increased by 25.9 percent, meaning the need for skilled workers is apparent. Icelandic shipping company Eimskip selected Portland as its North American headquarters in 2013, and the market reach that Maine businesses have as a result of Eimskip service has increased dramatically, Arnold said. According to the MITC, international container shipments from Maine increased by over 600 percent since 2009. Donovan said she was drawn to the IMT because it functions as an economic linchpin for the state. “What better avenue could there be to grow our economy?” she said. Eimskip currently operates 60 offices in a network of 48 total countries, and employs about 1,700 people worldwide. It operates 21 vessels sailing on six routes in the North Atlantic. According to Ross Hickey, assistant provost for Research Integrity at USM, when the Eimskip-Portland partnership was launched, it became as affordable to ship goods to Norway as it is to truck them to southern New Jersey. This principle of cost-based geography is critical to Maine’s continued expansion in the North Atlantic. “Building ties with Iceland is a vitally important element in connecting to the North Atlantic culturally, academically and economically,” Hickey said. Since 2013, when Eimskip first arrived in Portland, container volumes through the IMT have doubled. The Maine Port Authority and the Maine Department of Transportation have spearheaded a $20 million expansion of the facility that includes a new crane, a new reach stacker, improvements to rail facilities, construction of a new maintenance and operations facility, as well as improvements to the pier, Arnold said. 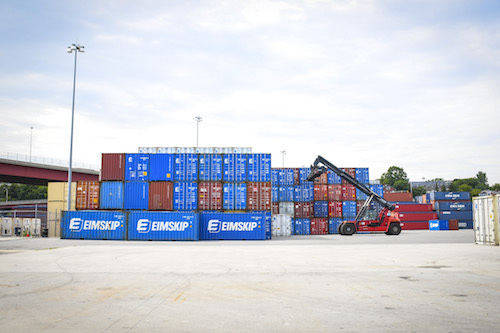 There were 9,682 container moves by water in 2017, up from 8,790 the year prior, Arnold said, in part because Eimskip now does a weekly run to the terminal as it delivers a variety of goods, including fish, foodstuffs, machinery and equipment. Hickey said the partnerships between USM and RU, and Portland and Iceland directly benefit both economies. “This partnership with RU will benefit our (and their) students by providing internship opportunities in the companies developing these growing business ties with Iceland and other countries in the North Atlantic,” Hickey said. While abroad, Donovan worked in container management at Eimskip’s headquarters in Reykjavik, putting her studies in economics and business to work. Although, it wasn’t the first time she’d gotten a behind-the-scenes look at how the company does business. Following the agreement between USM and RU, Eimskip announced a pilot project aimed at placing USM students in its Iceland office, and students from RU in its Portland office. Donovan took part in the project — working alongside the nearly 900 workers at the company’s headquarters in Reykjavik. While working at Eimskip in Reykjavik, Donovan said she was able to put into perspective how Maine’s economic limitations — a shrinking workforce and dependence on tourism dollars — can be remedied through a deeper focus on international collaboration. Donovan said Maine can bolster its economic impact by taking advantage of its natural resources — including seafood, agriculture and acres of undeveloped public lands — in innovative ways; by growing and empowering responsible Maine companies; and by attracting more people to live in the state. She said the similarities between Maine and Iceland, which has about one-fourth of Maine’s entire population, provide valuable lessons for each other as both countries expand their reach into the Arctic and North Atlantic. Both locations are geographically isolated, she said, with rural populations that are becoming increasingly more difficult to care for. In Maine, she added, there is an over-reliance on tourism; Iceland, however, is just beginning its foray into the tourism economy. While last semester’s program between USM and RU was just a pilot, with one student from each university participating, Hickey said the program will be expanded to two students from each university this next year. These students will be selected through a competitive process in the fall semester, he said, with the two selected USM students being provided scholarships to cover half of their expenses and tuition to travel abroad for the spring semester. The program will be used as a template that will be replicated in USM’s recently-announced partnership with Norway’s University of Tromsø. That agreement, announced in June, is aimed at exchanges, research and ongoing collaboration. The University of Tromsø, located in northern Norway, describes itself as the northernmost university in the world. Demographically, it resembles USM: the average age of its 15,000 students is 29 years old, and the school is working hard to meet regional shortages of teachers, nurses and engineers. “Other locations in the North Atlantic will be selected as well, building off the success of this model,” Hickey said. Donovan, who was recently hired as a freight forwarder at a company in Falmouth, praised USM for its pioneering partnerships with Arctic and North Atlantic institutions of higher learning, and for putting her education — and ultimately her career — first.